No matter who you are. No matter what your idea is. It doesn’t matter how nice you are (I mean it helps, but it won’t stop it). When you are working to create something new, or push the boundaries of anything, there will be haters. This can be an extremely difficult concept to get when you are a people pleaser. It’s taken me a long time to understand (I talk about that here, when I came to the conclusion that I am NOT for everybody). And here’s the thing, even though I understand it, I still struggle with it in reality. When I am passionate about an idea or a concept, I want everyone else to be as well. But not everyone will be. I was reminded of this concept when I saw this video today from Casey Niestat. Casey got an invite to the Boring Tunnel. What is that? 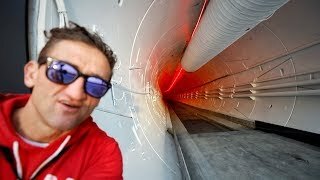 It’s a tunnel that the Boring Company, owned by Elon Musk, created. During his trip, Casey overheard grumblings that this “is just a big hole,” or “Musk didn’t invent the tunnel.” Okay. So if the guy that created the Electric car (that most of us want) and who has launched rockets into space can’t escape the haters…how can we? The short answers is…we can’t. If you are pushing the boundaries (on anything) there will always be haters. Oh, and here’s another cool thing. According to another hero of mine, Seth Godin, that might be a good thing. Once, when I asked him about how he deals with haters he told me, “If the haters have not shown up, you are not pushing hard enough.” Love that. So if you are: starting a business, creating content, writing a book, creating art, starting to meditate, reading books, working out, starting a new career, or creating anything new in your life, there will be haters. While you probably won’t like it, consider it a signal you are on the right track. Keep pushing. Make sure you never miss an update. Sign up for the VIP list here.